Do you know your Custom Car History? Let's take a look at some of the aspects of Custom Car History and a Short Look at the Evolution of Custom Cars! Automobiles never started out as custom cars. There was an evolution of creating unique custom cars that has changed from since it began to today in the automobile industry. In this article we will look at some of the biggest trends in automotive and the History of Custom Cars for each era. 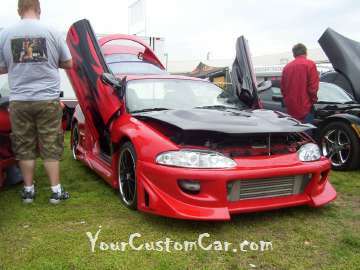 What is a Custom Car? The actual phrase “custom car” did not even start until the 1950s! There may have been custom cars before this time, but it was not until the 50's that people really started to use that particular phrase. 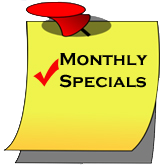 Definition: A custom car is a passenger vehicle that has been tailored to increase the car’s performance, which is done by altering or replacing the engine and transmission. By doing this alone it begins to make the car look unique – not like any other car of that make and model that has come out of the factory. Custom car builders can modify a vehicle with their own style and personal touch, or for someone else’s style. Ordinary vehicles have always been changed in order to look to look a little more unique, but there was another type of car customizing in the 50's that sprouted a whole new generation of Hot-Rodders! 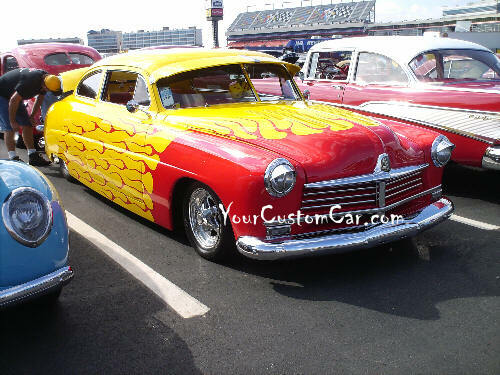 Hot rods were made to run faster and look extremely unique on the exterior with different paint designs, modified and relocated fenders, running boards, and more. The roomy interiors had their modifications too! The goal of creating a custom car was to make the vehicle unique by modifying or replacing the engine and or transmission, adding personal touches to the interior, and of course adding some flare to the paint all while having fun!. That is where customizing came into play with hot rods. Builders for hot rods would usually lower the suspension of the car with the rear a little higher giving it a "mean" race car stance, some builders replaced solid, straight axles with independent axles, threw on some Chrome wheels with big Whitewall tires, and more! Even the steering was modified to help with the handling of the tremendous sized cars of the 50's, and 60's. In the beginning of custom cars and hot rods, the cars were painted with bright bold colors, but they were all solid colors at first. Gradually over time, custom builders started to bring their custom cars to professional painters to give the vehicles a truly unique look with flames and other designs that made these cars stand out like nothing else. That is when businesses and large corporations saw the opportunity in this to advertise their business. So, the "Big 3", GM, Ford, and Daimler Chrysler, began to have custom cars built for the younger Hot-Rod nation to increase sales. With the word of the custom cars and hot rods spreading (which was easy because people started to talk about these rare vehicles), companies began to have vehicles created for advertisements, they had their logos placed on vehicles to sponsor a racer, and people returning from World War Two were coming back from this tremendous war with feelings of freedom and money in their pockets. What else would they do but get a custom car? Builders began to take custom car building to the next level by replacing even more auto parts, such as headlamp housings, bumpers, grills, taillights, as well as adding chrome to the vehicles. Some would add chrome stripping to the sides of the vehicle, replace the original painted bumpers with chrome ones, and the list goes on. We all know a little chrome can bring out the best in any automobile! Before Bondo(a polyester based body-filler) was created to fill small dents in metal panels/body parts, molten lead was used to achieve the same effect while repairing body damage. This did not make it easy for car customizers of that time being that this process was much more difficult to do. However, some die-hard "old Schoolers" of today, still use the molten lead method to repair and restore their Hot-Rods. Body work had now become an important part of building custom cars. People desired wild and beautiful paint jobs on their new custom vehicles. That is when body work shops and professional car paint designers began experimenting with different colors and designs. A lot of people liked to use candy apple red, metallic colors that created a glitter effect, and even metal flake paint. This was happening as early as the 1960s. 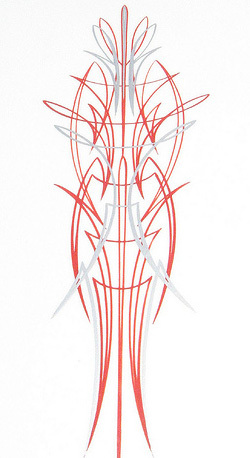 Some other paint designs were very popular around that time were, of course, flames, scallops, and hand painted pinstripes. The flames were very generic in the beginning starting behind the front wheels and going down the sides of the vehicle. 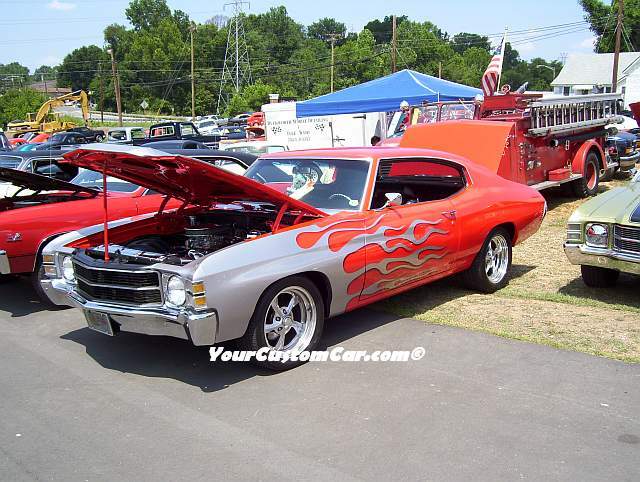 Then people started to experiment with the flame design by putting flames on the hoods, basically covering the paint of cars in flames, and creating flames with different colors like blue and green. 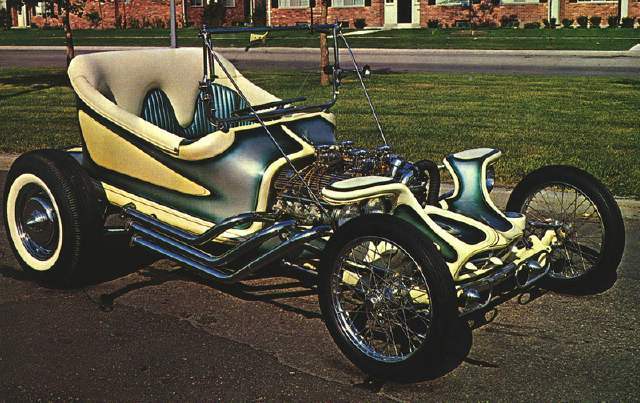 Two of the big builders in this era in history of custom cars were Ed “Big Daddy” Roth (see Outlaw image below), and George Barris (creator of the original Bat Mobile! ), both of whom have created some of the wildest custom cars in Custom Car History!! Soon builders began to use fiberglass and new steel on the bodies of their custom cars, and people with custom built cars had to go somewhere to show off their cars – where better than the local drive in restaurants? 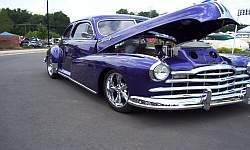 Today, custom car builders are extremely popular, some with their own shows. All of the work (mechanics, wiring, fiberglass, custom car pieces, and intricate paint jobs) that are put into custom vehicles of today are amazing. Now you know where it all started though! People such as Jesse James, Chip Foose, and Boyd Coddington have shown off their talents of working with custom cars and have created some of the most exotic custom cars of today. Who knows what that guys down the street is building in his garage. Maybe he will be famous one of these days for creating another piece of Custom Car History!